Learn how to grow Brussel Sprouts successfully and you will really enjoy eating them. Firm, fertile soil is essential for a tightly packed Brussel Sprout vegetable. If you are serving up loose, open sprouts to your loved ones, then - this hurts me to say - but you are to blame... ouch! 'Blown' brussels sprouts have virtually no flavour so it is not surprising that your family turns their noses up and would prefer to take a dose of cod liver oil instead. Just take a little time to learn how to grow brussel sprouts and it will pay you back with loads of fresh, tasty brussels sprouts. So don't despair - chin up old chap or chappess - follow the instructions and cultuvation tips on how to grow brussel sprouts below, then steam or boil them for just a few minutes to serve them crisp and tasty. You don't want those 'school dinner' type sprouts that have had all their colour and crispness boiled out of them. You can even dice or grate your brussel sprouts raw and serve them up in a salad - go on, be brave :0). Learning how to grow brussel sprouts should not be a disappointment to you now we have the modern F1 hybrids. Many of the old favourite, non hybrid varieties have been left behind by the F1's because of their non uniform growth habit and their ability to 'blow' quite quickly if not picked promptly. 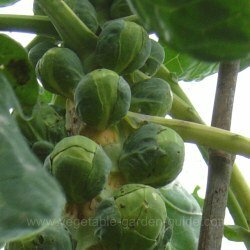 But once you have become an expert on how to grow brussel sprouts - why not try one or two plants of an older, non hybrid variety to experience the difference in taste and growth habit... it all adds to your knowledge and enjoyment of vegetable gardening. Ok... that's the intro over - let's get our hands dirty and if you're just starting to learn how to grow brussel sprouts - even better. As mentioned above, when learning how to grow brussel sprouts it is important to remember they require a firm, fertile soil as the main cause of failure (blown buttons) is loose, infertile soil. This is where a fairly heavy soil is an advantage to the vegetable grower. Using the three year crop rotation is ideal as you can plant them where peas and beans grew the previous year as their soil would have had manure or compost dug in. If that was the case, no more need be dug in. If that is not the case and your soil is poor, dig in plenty of well rotted compost or manure as early in the autumn as possible in order to give the the soil maximum time to settle. This gives time for the essential firmness to establish, whilst having that all important fertility... remember - feed the soil not the plant - an essential first tip if you are just starting to learn how to grow brussel sprouts. 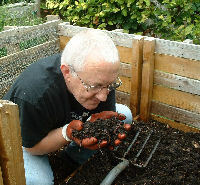 Thats me in the photo... just about to have breakfast mmmMMM - lets hear it for living soil! Acid soils encourage club root, a terrible disease of the brassica family which gardeners fear, so make sure you add lime to get a pH of about 6.5 to 7.0 - this is not rocket science. For those who want to know how to grow brussel sprouts without the guesswork just get yourself a pH meter or soil testing kit and follow the instructions. It's always a sensible move to get to know all the facts you can about your soil. Apply a dressing of a general fertiliser like Growmore in the spring, two or three weeks before planting out. Don't dig it in but rake gently over the surface as you will want to keep the bed firm. Brussels sprouts are quite often raised in an outdoor seed bed for transplanting into their permanent beds later. Again a very fertile soil is required to give the plants a good start. But as you will read further down the page you will learn how to grow brussel sprouts by sowing into seed trays for transplanting into their permanent positions - this is my prefered way. In early spring rake over and level the area you have chosen as a seed bed - frosts will have done a lot of the work of breaking down the larger clods of earth for you by then... hopefully. If you only require a few plants then this need not be too big an area. Cover the bed with sifted mature compost - the bed may be small enough to purchase a bag or two from your garden centre, especially if you're only just getting to know how to grow brussel sprouts you might not have the organic matter to compost. Tamp this down with the back of your rake to make it firm... but only when the soil is dry enough i.e. not sticking to your boots. Then lightly rake it over to produce a fine tilth. Mark out the rows using string stretched between two stakes for a straight line and make shallow drills along the length of the string with a trowel or the edge of a hoe 13mm(1/2") deep and rows 15cm(6") apart. Sow the seed thinly into the drills and cover them over with soil, lightly firming with the head of the rake. Mark both ends of the row, labelling one end with the variety and date of sowing. Keep the seed bed moist, always use a fine spray. 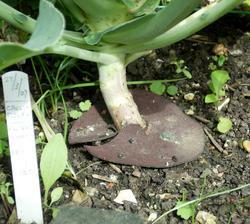 When the brussels sprout plants are about 2.5cm(1") tall, thin the seedlings to about 7.5cm(3") apart in the rows. This is to stop overcrowding thus causing the seedlings to become weak and spindly. Then make your choice... especially around a nice cosy fire. The anticipation really energises you for the coming spring. Sow early varieties outdoors in mid March, transplanting in mid May. This will give a crop of brussels sprouts during October and November. For an earlier crop (September), sow seeds under cloches in early March and plant out in early May. Sow late varieties outdoors in April and transplant in June. This will produce brussels sprouts between December and March. As ever, when growing any vegetable, there are other ways to achieve the same outcome. 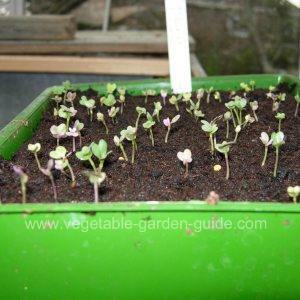 So if you have a greenhouse, cold frame or cloches - growing brassicas (sprouts, cabbage etc. family) from seed can be made easier and more convenient if you don't have a large garden to accommodate a seed bed. So if you have a greenhouse, cold frame or cloches - growing brussel sprouts from seed can be made easier and more convenient if you don't have a large garden to accomodate a seed bed. 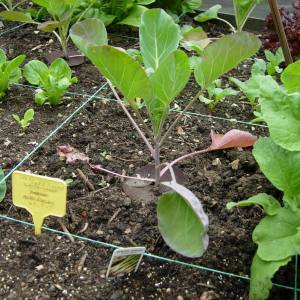 Sow brussels sprout seed in a tray filled with seed compost bought from your local gardening centre. Water thoroughly and place them inside one of the above (cloche etc...). When the first two leaves have formed prick them out into 7.5cm(3") pots filled with potting compost. Plant them into these pots a little deeper - to just below the two leaves - water in well. Leave plants to grow on until tall enough for planting out by following the growing instructions above. For a more detailed description of how to grow brussel sprouts by sowing seed into trays click here - Starting Vegetable Seeds - This will open the webpage into a new window. The place chosen as your permanent bed for your brussels sprouts can be in full sun or partial shade, partial shade is better. Water plants the day before you aim to transplant them into that well-firmed bed prepared last autumn - all ready to settle down to the long growth to maturity. Transplant brussels sprout plants in the evening to minimise distress and to make a quicker recovery - keep as much soil around the roots as you can. If you're just starting to learn how to grow brussel sprouts and you want to be a bit geeky, these leaves are called cotyledons or 'seed leaves'. Firm the soil around each plant with your hands or the dibber. Remember - firm planting helps to grow firm, tight brussels sprouts. Note Well... an important point to remember when learning how to grow brussel sprouts is that transplanting is necessary. Planting out seedlings from pots or seed beds encourages a stronger root system to be established in their permanent bed. Planting distances vary depending on the vigour and size of the variety. For hybrid varieties - 45cm(18") to 60cm(24") each way. Non-hybrid types - 60cm(24") to 90cm(36") each way. Don't forget, all this information will be on the seed packet - you can't go wrong. Water well after transplanting. The spacing is important but it does not have to be wasted space. Plant quick-growing crops in between like lettuce, salad leaves and many others. 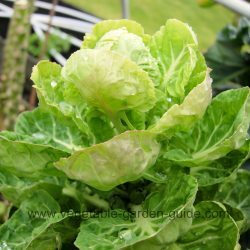 The way to get the best out of any plant, especially if you're just beginning to learn how to grow brussel sprouts, is to regularly observe their growing characteristics. You'll notice what time of the season potential pests and diseases begin to appear or when staking is required, and best of all - the optimum time to harvest. Hoe regularly to keep down weeds but don't loosen the soil to deeply - a firm bed... remember! - in fact earth up around the plant stems from time to time and firm the soil down to help support the brussels sprout plant as it gets taller. Water the young plants in dry weather but unless you have a prolonged dry spell the mature plants should'nt need watering - this is because you have prepared the bed properly... right! One major enemy of your attempt to grow vegetables are birds - especially in country gardens, they particularly seem to like brussels sprout plants. Protect the smaller plants from sparrows and the bigger mature plants from wood pigeons... but only do so when you see signs of attack. As the plants get taller make sure you support them so that the strong winds in winter don't blow them over - tie them to stakes. The old practice of pinching out the growing tip to hasten maturity is no longer recommended. Mulch around the base of the plants with well rotted compost to feed the plants and conserve moisture. Eggs of the Large White butterfly. Caterpillars can defoliate a plant quickly so watch out for them. Inspect the underside of the leaves for clusters and squish them. Practice your tennis strokes when the butterfly is about. Best to put netting over them if your new to or just learning how to grow brussel sprouts. Caterpillar of the Small White butterfly. Defoliates plants quickly, watch out for them. Pick off and destroy, use a nematode spray or spray with an insecticide that your nursery recommends. Eggs are laid under leaves in a random way, not in clusters, nor are they brightly coloured. Again, net the plants. Knowing how to grow brussel sprouts to minimise pest problems will mean following some sort of crop rotation plan. This simply means not growing vegetables of the same family in the same piece of earth year after year...it encourages pest build up and nutrient depletion in the soil. For brussel sprouts this means - Broccoli, Cabbage, Kohl Rabi, Turnip, Cauliflower. Whether you are a seasoned vegetable grower or you are just starting to learn how to grow Brussel Sprouts or any vegetable - pests and diseases don't care... so get to know your enemy. can be a problem so use protective discs (see photo on right) at the base of the growing Brussels Sprout plants - they lay their eggs in the soil at this point. left unattended will devastate your Brussel Sprout plants. They feed on the underside of the leaves and the best answer is to just pick them off and... squish 'em. They also lay their eggs there too so look for yellow clusters aannndddd... squish 'em. If you you haven't the time to keep squishing - or the stomach (sorry but this all has to do with learning how to grow brussel sprouts), then use 'Just Caterpillar'. It uses nematodes to provide an environmentally safe and efficient treatment which can be watered straight onto edible plants. Use 'Just Caterpillar' once they are seen on the plant, preferably whilst they are still small, and the nematodes will quickly seek out the caterpillar and kill it. Get it from your garden centre. 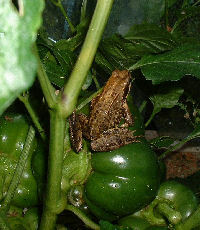 can be a serious pest by weakening your plants and introducing viruses. Try planting Marigolds or Tagetes amongst the crop. They attract beneficial insects like hover flies and lady birds which feed on the aphids and will help reduce the infestation - yet another aspect of learning how to grow Brussel Sprouts and other garden vegetables is to understand how nature can be used to benefit your environment. Spraying is the only way to have a real impact on badly infested plants. Major changes have taken place in the UK and Europe concerning the availability of pesticides during recent years. Visit your garden center or nursery and seek their advice as what to use. Use horticultural fleece placed over your brussels sprouts, as soon as you transplant them outside; a floating row cover. Start picking when the sprouts or 'buttons' are about the size of a walnut and are still solid and compact. Begin at the base of the stem and work upwards only taking a few brussels sprout buttons from each stem at a time. They can be snapped off with your fingers or cut off with a sharp knife. Remove any yellowing leaves or 'blown' sprouts as you go and don't leave any hanging about on the ground which attract slugs. Once all the sprouts have been harvested you can let the 'tops' grow for a little longer and use them like cabbage. These are delicious and tender. When everything is used dig up the stem and dispose of it. I shred mine and add it to the compost heap. Alternatively mash it with a hammer and then add it to your compost heap. 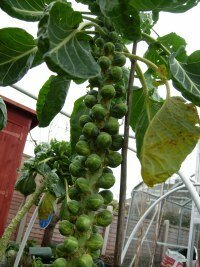 Once you have learned how to grow Brussel Sprouts the knowledge gained will apply to many other vegetables, so turn your expertise to growing other veg also. The picture on the left indicates that the brussel sprout buttons are not the only part of the plant that you can use for cooking. Once all the sprouts are picked leave them in the ground for a while longer and let the tops sprout - they are very tender and delicious. 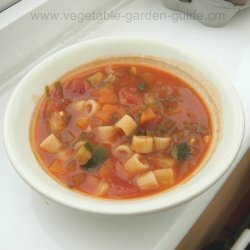 The picture on the right shows a bowl of homemade minestrone soup that Ros made incorporating the sprout tops - wohoooo! it was delish. This soup was made from a Weight Watchers recipe (I'm hoping to get into my bikini this year ;0) ), only one point per serving for those that know about these things - it's a win win situation. Give them a try. You now know how to grow brussel sprouts - it's up to you to put it into practice. Remember you don't need to have everything 'just right' because you won't... there are too many variables. Just follow this guide and get out there and do it - you will absolutely learn from your experiences. Remember, remember even the most experienced gardeners have failures... and they're honest about it too.